A House Democrat who recently announced his intention to investigate right-wing hate groups once appeared on a Nation of Islam radio show and made controversial racial remarks. After Democrats took control of the House of Representatives, "Hate groups are about to find lawmakers eager to scrutinize them," McClatchy reported Friday. 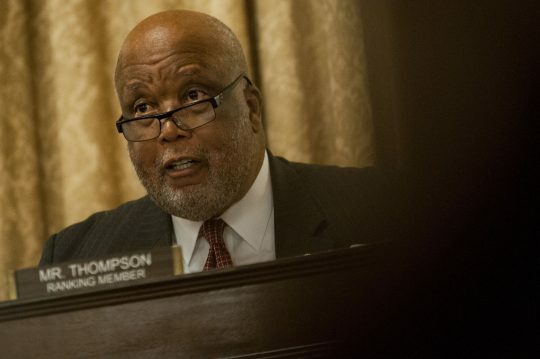 "Rep. Bennie Thompson, an African American lawmaker from Mississippi, is in charge of the House Homeland Security Committee. He plans to act," McClatchy reported. "Thompson intends to hold hearings to spotlight what experts say is a growth of deadly right wing extremism in America, even if the hearings could feature members of white supremacist groups." Republican members of the committee tell McClatchy that they are concerned the hearings could become politicized. "I worry that it becomes completely political – a political cudgel and a political issue and we don’t focus on the violence and the problems we have in society and any potential solutions," argued Rep. Scott Perry (R., Pa.), a member of the House Freedom Caucus. "I just think it would be better to characterize it as violent extremism and look at all of it." Thompson himself has a history of flirtation with extremist groups, appearing in 2014 on the New Nation of Islam radio show and making a series of controversial statements, such as calling Supreme Court Justice Clarence Thomas an "Uncle Tom" and suggesting Republican opposition to Obamacare was due entirely to race. "I never saw George Bush treated like this. I never saw Bill Clinton treated like this with such disrespect," Thompson said at the time. "That Mitch McConnell would have the audacity to tell the president of the United States – not the chief executive, but the commander-in-chief – that ‘I don't care what you come up with we're going to be against it.' Now if that's not a racist statement I don't know what is." Thompson's comments received widespread coverage at the time, sparking criticism even from liberal commentators. But the fact that Thompson granted an interview to the New Nation of Islam – a splinter group from the larger Nation of Islam founded by a man who goes only by "Son of Man" – went largely unremarked upon. While split from the Louis Farrakhan-run Nation of Islam, the New Nation of Islam holds the same extremist positions that led the Southern Poverty Law Center to designate the Farrakhan branch a hate group. The New Nation opposes "intermarriage or race-mixing" and supports the segregation of the races, arguing that proponents of integration "are trying to deceive the black people into believing that their 400 year-old open enemies of freedom, justice and equality are, all of a sudden, their ‘friends.'" In the same year Thompson appeared on the program, "Son of Man" made comments on his radio show indicating he believes traditional Nation of Islam teaching that white people are subhuman monsters created 6,000 years ago by a scientist named Yakub. "Yakub wasn't white, he was black," he preached. "But he made a man white that he wanted to go and deceive us." Thompson was also a member of the Congressional Black Caucus in 2002 when it invited Farrakhan to speak at its annual legislative conference and in 2005 when it met with Farrakhan behind closed doors. Thompson's office did not respond to an email asking if he attended either event, although the Nation of Islam newspaper Final Call reported that the 2005 event was attended by "practically all 43 CBC members." This entry was posted in Politics and tagged Democratic Party, House Democrats, House of Representatives. Bookmark the permalink.